Are We There Yet?? : Open Wide! In just a little while I'll be waking Amanda up so that she can take her prescribed dose of Xanax prior to her oral surgery which is scheduled for 9:30 EST today. Whoever thought of giving patients something to relax them prior to having their wisdom teeth removed is a genius as I think Amanda is most definitely going to be nervous - not so much about the extraction itself but about the IV that they are going to be putting in her arm to administer the Versed used to send her off to LaLa Land during the procedure. Yep, our own Miss Delirium is deathly afraid of needles. Go figure! I guess everyone is afraid of something and if it isn't ghosts and ghouls and things that go bump in the night, it may as well be needles! I personally have no problem with needles in spite of the fact I have horrible veins but I make up for that by having a nice healthy fear of heights. Heck, my palms sweat just watching a high-wire act on TV! My friend Andrew, who is a paramedic, checked out Amanda's veins the other day and told her that she'll have no problems as she's got lots of available sites (thank goodness she didn't inherit my sorry-excuse for accessible sites to sink an IV) and that she probably won't even feel it when they put the needle in. The doctor has told her that they freeze the site prior also so as long as she has her iPod earbuds firmly in place and looks the other way, she should be fine. That dose of Xanax will probably help, too! If all goes well, she should be in and out of the dentist chair in less than an hour and back home before she even knows it. As a matter of fact, if she has the same reaction I did to the Versed, she probably won't know it! I've jokingly told her that I was going to bring a video camera to record how she reacts to the drug but I'm still debating whether to actually do it or not. Truth be told, I wish someone had videotaped me after my surgery on the 12th as I'm still wondering whether I did or said something more embarrassing than asking about cute guys in the waiting room! Anyhow, happy thoughts and well wishes for a speedy and relatively painless recovery for Amanda would be greatly appreciated today. As someone who has all of her wisdom teeth still intact I'm not sure exactly what Amanda will be going through but as her mother, of course I hope it's a simple procedure with an easy recovery period. Update! Amanda is sleeping soundly (in my room, of course) after what the dentist said was a very easy extraction and two teeth that just "popped" right out. At the end of surgery she was laughing and giggling and acting quite like she'd had way too much too drink (and yes, I have video!). Her first request was her cellphone so that she could twitter an update - oy! -with her second request being a shake from McDonald's because she was starving. It was too early for Mickey D's so she came home and had a small glass of milk with a Tylox before deciding I was right after all and she really wanted to sleep for awhile. That was close to three hours ago! When I was in the fertility program years ago I had to have blood test constantly. My veins are not easy and they always tried for the surface veins, never with any success. I finally had to insist they not even try because I ended up with the most god-awful bruises you ever did see! Just as the briuse faded, it was time to start it all again! I'm with Amanda...I hate needles. I can't watch blood draws or IV setups. I'm sure she will do fine. I remember when mine came out. I got nothing and they took all of them the same day. It was awful. Glad to hear that Amanda's surgery went well. My eldest son is terrified of needles and passes out! I don't like needles either. They really make me tense up. Well done to Amanda for braving all that. I'm sure she'll heal pretty quick. And I presume she'll have words with you about taking that picture. I'm glad she's okay! I would go to the doc 100 times before going to a dentist. Needles don't bother me at all and I've found where my good one is and always ask them to draw from that one. But that hook thing the dentist uses to scrape your gums - Oh the horror! Years ago, I had that done and bent the arms of the chair and had tears running down my cheeks! And I didn't make him quit! What's the matter with me? I wouldn't put up with that today!!! I had gingivitis and lost my teeth at 23. Had toy teeth ever since. But I still HATE the dentist! Glad she's doing well. 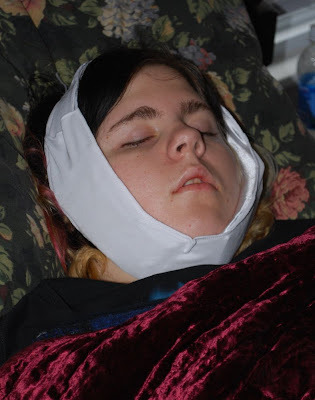 Why didn't they have those chin strap things when my daughter had her wisdom teeth out? Come to think of it, when I had them out too? That is soooo smart. Let her sleep. Did she wake up yet???! !